For over 15 years, Gold Tone has easily proved the best value in beginner to professional level openback banjos. Playability, tone, and quality designs are our trademark. The CB-100 was created to meet the demands of the modern old-time player. 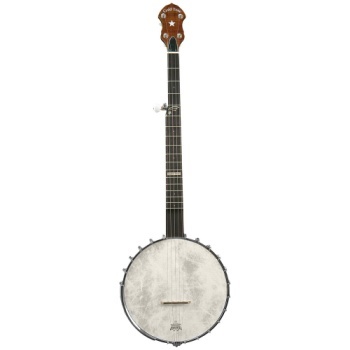 This banjo is lightweight with a minimalist design that yields nothing but effortless playability and a traditional tone that just begs to be played. At an entry level price with all the features of a high end openback, the CB-100 includes a maple neck with a scooped rosewood fingerboard, rolled brass tone ring, a vintage neck design, Fiberskyn head, planetary tuners, and a No Knot tailpiece. Final assembly and complete setup performed at the Gold Tone Factory in Florida. The CB-100 features a unique Gold Tone designed faux dowel stick in which a coordinator rod is threaded through the dowel to allow for action adjustments. If you have every owned a tradional dowel stick banjo, you will agree this feature is infinitely superior without loosing that classic apeal!